The farmer looks at the man, obviously a yuppie, then looks at his peacefully grazing flock and calmly answers, “Sure, why not?” The yuppie parks his car, whips out his Mac Book Air, links by wifi to his iPhone 5. He turns on his Garmin Nuvi sat nav to get an exact fix on his location, uploads his location to a NATO satellite which then creates a series of ultra-high-resolution images of the hillsides around him. Downloading the photos via a real time image enhancing facility in Hamburg, Germany, within seconds, he prints out the full-colour, 150 page report on his portable LaserJet printer. Taking off his Ray Bans, the young man unbuttons his Armani jacket and smiles to reveal two rows of perfect ultra-white teeth. Turning to the farmer he says, “You have 1,586 cows and calves.” “That’s right. Well then, I guess you can take one of my ‘calves’,” says the farmer. He watches the young man select one of the animals. Sometimes people appear to make the same mistake about the church don’t they? We can learn a lot from the secular world about leadership, about management, administration, personnel, PR, communication, media, advertising, planning, marketing, budgeting. We can employ the most sophisticated technology there is to build the Church. But… if we forget the basis of our calling, if we neglect the Biblical pattern for ministry, if we come to rely on external aids rather than the Holy Spirit, we will be not be faithful, fulfilled or fruitful in building the church of our Lord Jesus Christ. To be faithful we must recognise who we are not. To be fulfilled we must know who we are. To be fruitful we must lead people to Jesus. John the Baptist drew large crowds out into the desert. His preaching was contemporary and controversial. It was personal and it was powerful. Not surprisingly, he also attracted the attention of the religious leaders of Jerusalem. They sent a delegation to interrogate him. John was an enigma. He did not conform, so they wanted to know more about him. “Who are you?” they asked. John responds by vigorously telling him who he is not (His reply in the original Greek is most emphatic. John’s day was one of great Messianic expectation. Everyone was looking for the promised Messiah, so naturally John’s actions and message created a lot of speculation as to who he might be. Could he be the promised Messiah? John denounces any notion of the kind. “I am not the Christ,” he asserts. Whatever John was, he was certainly not the Christ. There was a Christ, but he was not him. Well, “Are you Elijah?” they replied. That is not such a dumb question as it may sound. The prophet Malachi predicted that an Elijah figure would precede the coming of the Messiah. “See I will send you the prophet Elijah before that great and dreadful day of the Lord” (Malachi 4:5). Perhaps John was Elijah. After all, his appearance was similar. His message was similar. Elijah did not die. Was this the great Elijah? “I am not,” replies John. “Then are you the great Prophet?” Deuteronomy 18.15-19 speaks of a great prophet like Moses who would come and restore Israel. This promise was taken to refer to a special end-times prophet. Surely John is the great prophet. Again with an emphatic, “no”, John denounces this title. As a proper witness, John recognized who he was not. His three-fold denial makes his witness clear. The increasing curtness of John’s successive answers cannot be missed here. John seems to have had a dislike for even answering questions about himself. He had come to bear witness to another. He recognized who he was not. But what about us? If we are going to be faithful servants, we must recognize who we are not. We must not get in the way of Jesus. Jesus tells us “Very truly I tell you, servants are not greater than their master, nor are messengers greater than the one who sent them.” (John 13:16). Paul describes this principle in his letter to the Romans. Pride is the greatest impediment to faithful service in the Church. As a test, reflect upon your conversations today. How much have they focused on you and how much on the needs of others? How quick are you to seek advice and how quick to give it? How often are your sentences phrased as questions and how often as answers? How often are they giving orders instead of offering help? These are some ways of evaluating your servant quotient. To be a faithful servant we must recognise who we are not. John knew who he was not, which leads directly into our second point. Not content with John’s denials, they question him further, “If you are not any of these people, then who are you?” What is your role? What do you have to say about yourself? Show us your resume. But John did not flash his credentials. He did not flatter himself or build his own name. He did not attempt to appear important. John knew who he was, because he knew his destiny from the Scriptures. “I am the voice of one calling in the wilderness…” John knew his calling and purpose. To be a voice for God’s message. Unlike the eternal Logos of the Prologue, a voice is temporary. A voice is fleeting. A voice is fading. And that is John’s view of himself. The message was more important than the messenger. John’s purpose was to point people to Jesus, to lead people to Jesus, to introduce people to Jesus. And like John, that is our role too. John knew who he was. Do you know who you are? John knew his role from the Scriptures. Do you know your role? Earlier I quoted from Romans 12:3 where Paul urges us to not think more highly of ourselves than we ought. But notice how his argument develops. There’s a reason we should not be arrogant, or aloof or independent. John was called to be a prophet to lead people to Jesus. What have you been called to be? We have each been called to serve in different ways in the local church, according to God’s grace, with one purpose – to lead people to Jesus – to lead children to Jesus. To lead teenagers to Jesus. To lead students to Jesus. To lead singles to Jesus. To lead marrieds to Jesus. To lead yuppies who drive BMW’s and wear white Armani suits to Jesus. If you have received Jesus, then you have been called to serve Jesus as well. Let me be honest with you. I believe we are operating well below our redemptive potential as local churches because we are not harnessing all the God-given talents and abilities he has entrusted to us. Our 2020 vision here at Christ Church is to become an Acts 2 Church where the Lord is adding to our number daily, those whom he is saving. My role is to help followers of Christ find their place of service – to experience deep fulfilment and joy in serving Christ with their time, their gifts and abilities. Our expectation of church members is that we give a minimum of an hour a week to the Lord’s service. I don’t think that is too much do you? Remember, to be faithful we must recognise who we are not. But, to be fulfilled we must know who we are in Christ. John was not afraid to tell these religious leaders they did not know God. The Son of God stood in their midst and they did not know him. They did not recognize him. Do you? Do you know him? There are at three things John tells them about Jesus. Loosening another’s sandal was the most menial of tasks. Only the lowest slaves would loosen sandals. Even disciples were not asked to loosen the sandals of their teachers, yet John says, “I am unworthy to do the single most humbling task—loosen His sandals.” John stresses the one task that rabbinic Judaism taught was too menial for the disciple, and John emphasizes that he is unworthy to perform this humbling task. “I am unworthy to untie his sandals.” Why? Because of Jesus’ greatness. In simple reverence John conveys the profound truth that Jesus is the eternal, pre-existent one. Sometimes we can be over-familiar with Jesus. If John was unworthy to until the sandals of Jesus then… reverence is appropriate. Jesus – before us as creator, beneath us as saviour, with us as friend, above us as Lord. John spoke of Jesus’ greatness. Jesus: the majestic Lord. “Look” said John. He pointed people to their Saviour. John spoke of Jesus’ greatness: the majestic Lord. 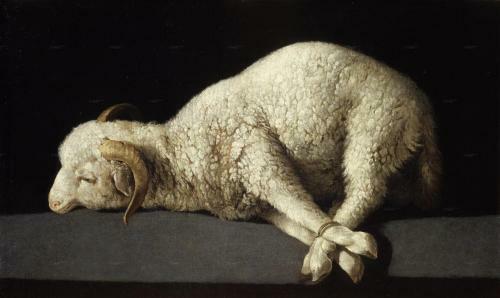 John predicted Jesus’ sacrifice: the Lamb of God. John’s public testimony climaxes in his identification of Jesus as the Son of God. Jesus is the Son of God. He is divine. He is fully human yet fully God. He is the chosen One, sent by God. He is the One who was with God and who is God. John testified to what he had seen. What he had been told. What he had experienced. That is all God expects of us. To tell others of what God has done for us, what God is doing in us, what God will do through them. John proclaimed Jesus’ greatness. John predicted Jesus’ sacrifice. John pronounced Jesus’ deity. A father and his small son were walking down the street past a construction site for a new skyscraper. Glancing up, they saw men at work on the high storey building. “What are those little boys doing up there?” asked the son. “Those are not boys, they are grown men,” replied the father. After a pause, the boy pondered, “I guess when they reach heaven there won’t be anything left of them.” The nearer we come to Jesus, the less others will see of us and the more they see of Him. That is what we learn from John the Baptist. To be a faithful we must recognise who we are not. But, to be fulfilled we must know who we are in Christ. And, above all, to be fruitful all we have to do is simply lead people to Jesus and let him do the rest. Lets pray. With grateful thanks to Jerry Shirley and Devin Hudson, Charles Swindoll and Warren Wersbie for ideas and content used in this sermon. This entry was posted in Evangelism, Sermons, Theology on October 9, 2012 by Stephen Sizer.